Skyfall a one-bedroom, first floor apartment has been fitted out to the highest of standards. 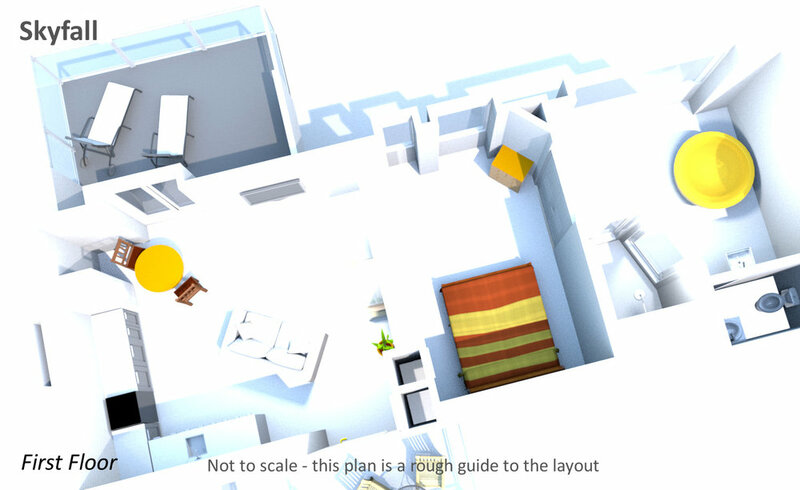 Split into three main areas, the kitchen/living area has access to the balcony. The open-plan bedroom is centrally located, with double doors opening into the large bathroom featuring a large copper spa bath with spectacular countryside and sea vistas. The bedroom area has a Canadian pine, super-king size bed with memory foam mattress. The bathroom has a free-standing copper spa bath with glistening nickel interior, the bath has been meticulously hand finished by master craftsmen at the world’s leading specialist manufacturer of copper baths. Take advantage of the large rainfall shower or enjoy the spacious steam room with star lighting. Super soft, fluffy towels and locally made herbal infused toiletries are included. Skyfall is atmospherically lit, creating a romantic setting for couples to unwind and relax. The apartment has a contemporary feel and the sitting area has a cosy sofa, 50" Smart 4K Ultra HD HDR TV with Blu-Ray/DVD player and a Soundbar. There is underfloor heating throughout and in the cooler months cosy-up beside the stunning fire in the living area. The steam room provides a range of health benefits, spending time in one can help to reduce stress, help with breathing issues, relieve muscle pains and even help you sleep. The fully equipped kitchen has a dishwasher, an electric oven, induction hob, fridge/freezer and washing machine. Access to a tumble dryer is nearby along with a selection of DVDs and books. Please note: Skyfall is located on the first floor and access is from an outside staircase. Please read the following Steam Room health and safety notice before booking. The patio doors open to the balcony area with countryside and sea views. Views inland can also be admired from the smaller balcony area at the entrance, perfect for a morning coffee while the sun rises. A freestanding charcoal BBQ is available on request. There is parking nearby. Private balcony with countryside and sea views.